Nearly all long-term studies on diet and nutrition agree—the Mediterranean eating pattern is one of the healthiest diets in the world. If you're managing diabetes, it may be the perfect eating pattern for you. Indeed, for the first time ever, USNEWS and World Report magazine has ranked the Mediterranean Diet as the Best Diet Overall, and the Consensus Report by the American Diabetes Association (ADA) and the European Association for the Study of Diabetes (EASD), Management of Hyperglycemia in Type 2 Diabetes, 2019, cites evidence that the Mediterranean Diet is an effective component of diabetes lifestyle management. Now updated and expanded with dozens of new recipes, this ultimate guide to Mediterranean cooking is perfect for anyone looking to eat well. 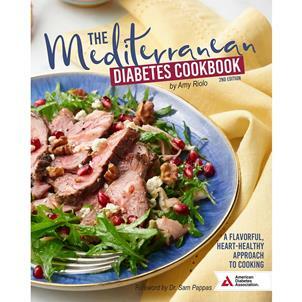 In the first edition of this award-winning guide to Mediterranean cooking for diabetes, culinary expert Amy Riolo took readers and home cooks on a journey through the flavors of Italy, Greece, Turkey, and Egypt, where the traditional cuisine and lifestyle have kept generations heart healthy and fit. In this comprehensive update, she brings dozens of new recipes, tips from local cooks, and the latest in nutrition science to create a guide to cooking and eating for diabetes that's bursting with flavor and based on fresh ingredients and simple cooking methods. No artificial ingredients, no unrealistic portions, and no compromises. Imagine cooking without sacrificing taste, using healthful, fresh ingredients. Leave behind the tired, watered-down diabetes recipes crowding out taste in your other cookbooks and regain the joys of eating.